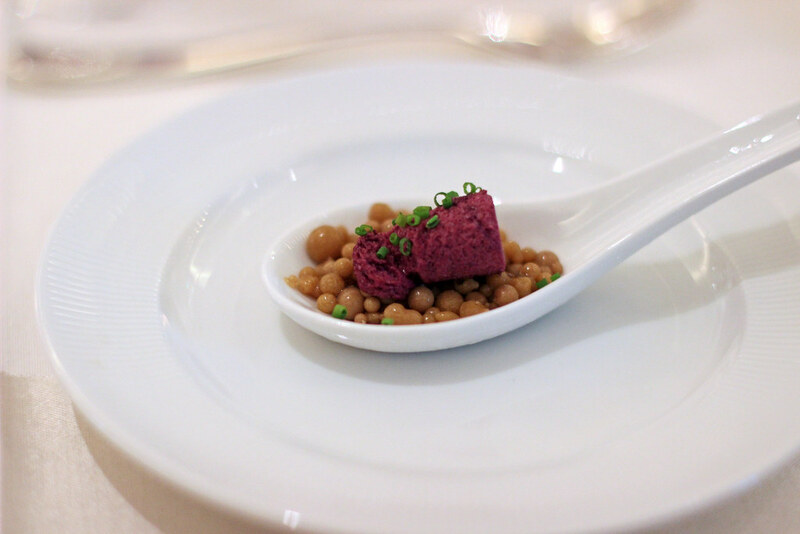 As another amuse bouche, a spoonful of frozen "pearls" of foie gras, topped with an airy Concord grape sponge and a scatter of chives - in combination, uncannily reminiscent of peanut butter and jelly (in a good way). 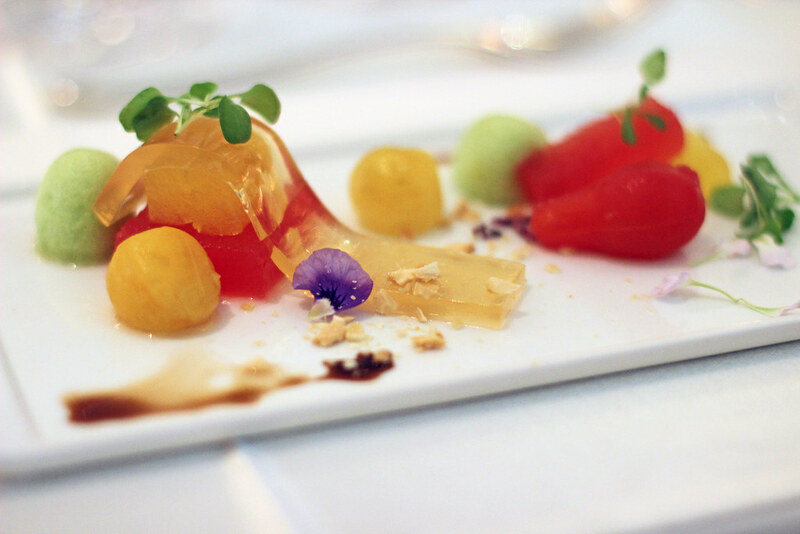 The first "full-size" course was a visual stunner, a salad of compressed melon and peeled heirloom tomatoes draped with a translucent sheet of ibérico ham gelée, tufts of fava bean foam and crumbles of marcona almonds. 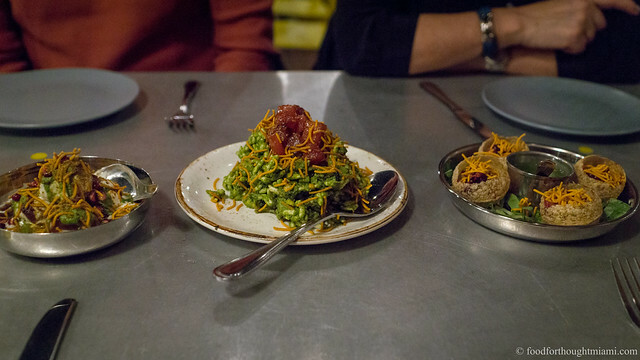 Dishes based on traditional pairings face the inevitable question: is it better than the original version? Here, I probably would have taken slices of plain jamón ibérico and melon, though the presentation would not have been as dramatic. I found the flavors a bit muted - best in combination, the melon and tomatoes needing the salt of the ham gelée to really reveal themselves. The next dish had no trouble announcing itself. 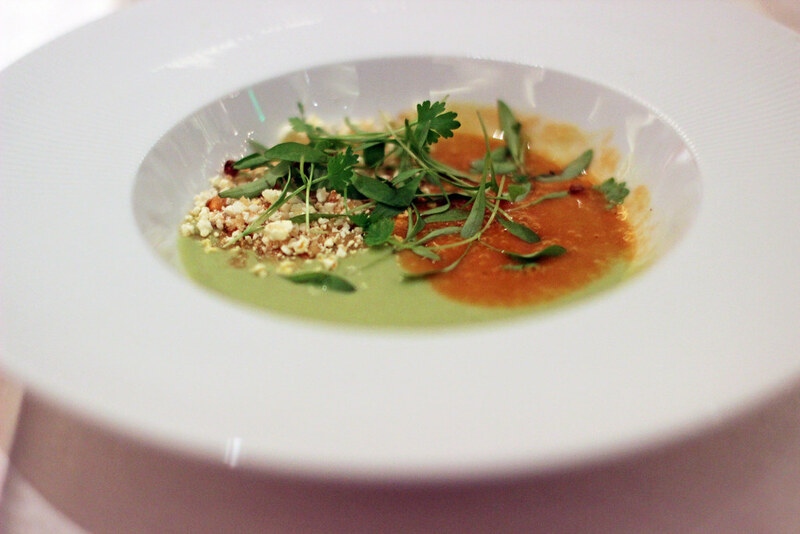 The flavors of guacamole were recast as a silky avocado soup paired with a ruddier chile-infused tomato purée, but the real highlight here was the "popping corn," a pop-rocks like crumble of carbonated dried corn that started to audibly crackle and pop as the plates were being put on the table and continued to do so as you ate. Gimmicky? Perhaps - but also really fun, and maybe it was just my imagination, but the popping sensation really did seem to open up the flavors of the other components. Ask the same question here - how does it compare with its original inspiration? - and this dish holds up just fine. 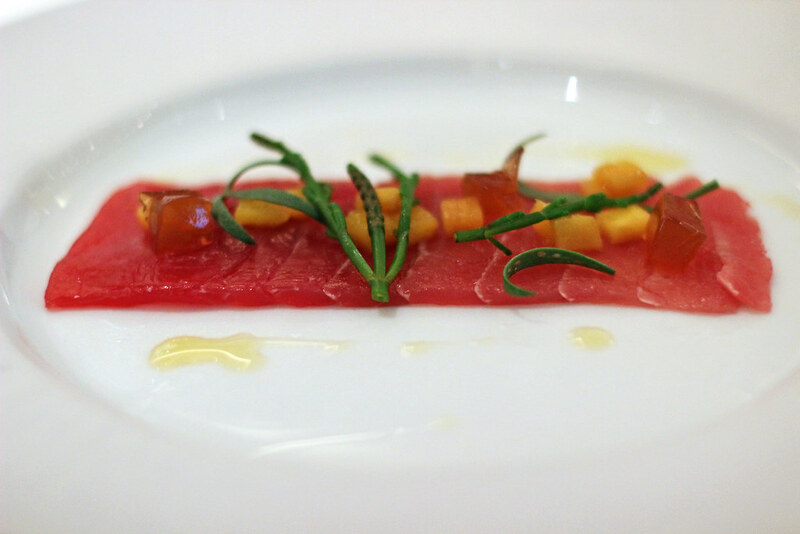 A Hawaiian ahi tuna carpaccio relied on no special effects. 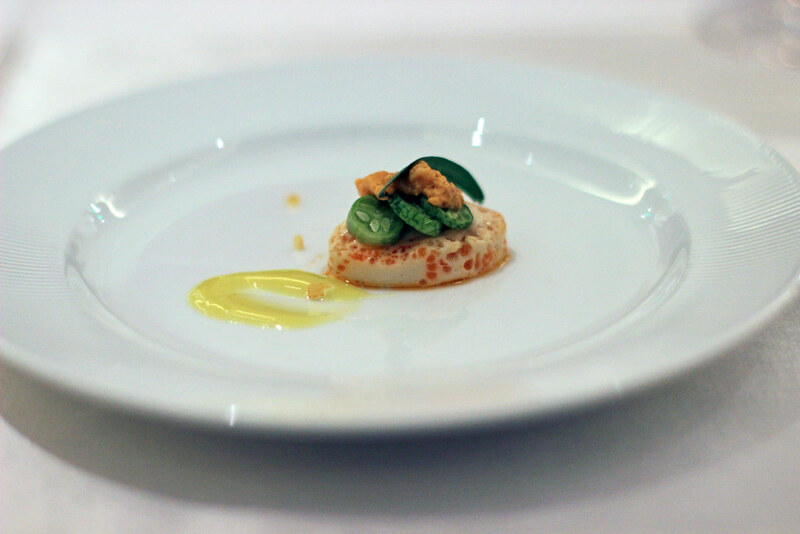 A thin sheet of pristine tuna - simultaneously meaty and silky tender - was topped with small dice of fresh mango and a ginger gelée along with sprigs of pleasingly snappy salicornia (a/k/a "sea beans"). But the one subtle addition that really made this dish sing for me was the drizzle of guajillo chile infused oil - a bright spark of spice that enhanced everything else. 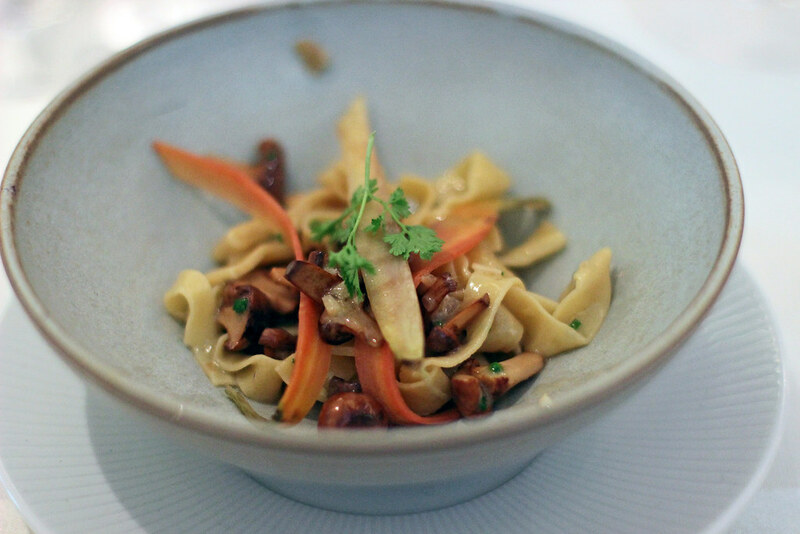 The next dish was brought to the table in a large bowl cloaked by another overturned bowl on top - with the unveil revealing a tangle of "smoked" linguine, chanterelle mushrooms, delicate ribbons of Farmer Jones carrots, pistachios, chervil, and orange zest. This was one of my favorite pasta dishes in recent memory - an uncustomary but completely natural combination of ingredients that offered a great interplay of flavors and textures. A crispy poached egg was another of the highlights of a very good meal. 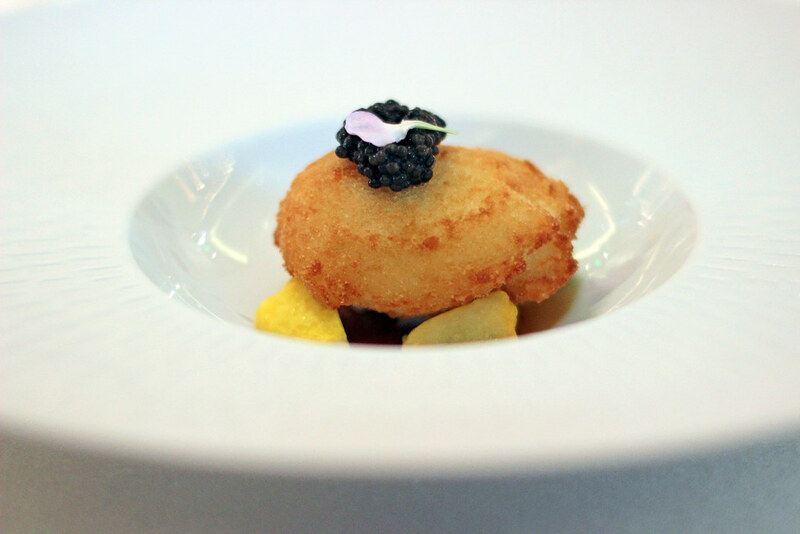 The egg was perfectly poached, then coated in a delicate crumb and quickly deep fried, and for an additional bonus, then injected with a vibrant basil infusion. 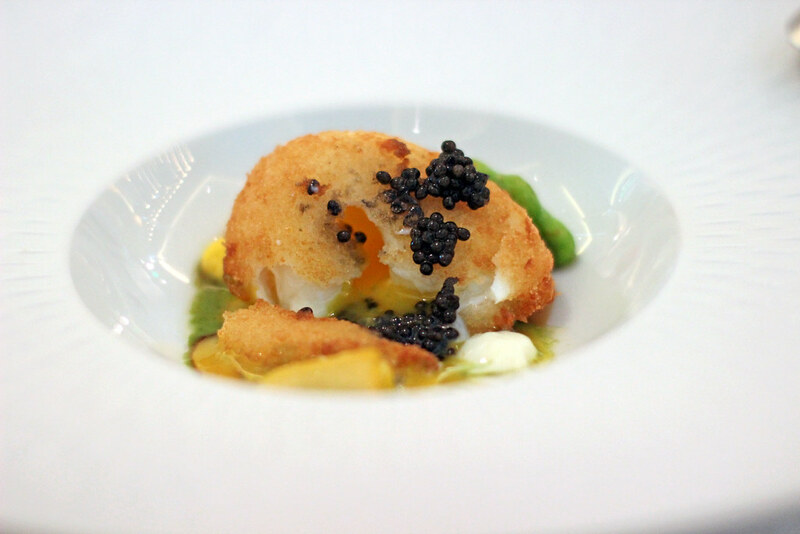 Nestled over a bed of baby squash in a cabernet gastrique, and crowned with Florida-raised Siberian sturgeon caviar, this brought together the lush richness of the oozy egg, the crunch of the crispy shell, and the saline pop of the caviar, all cut through with the gentle green flavors of the squash, the more assertive basil, and the tangy gastrique - each distinct, yet contributing effectively to the whole. 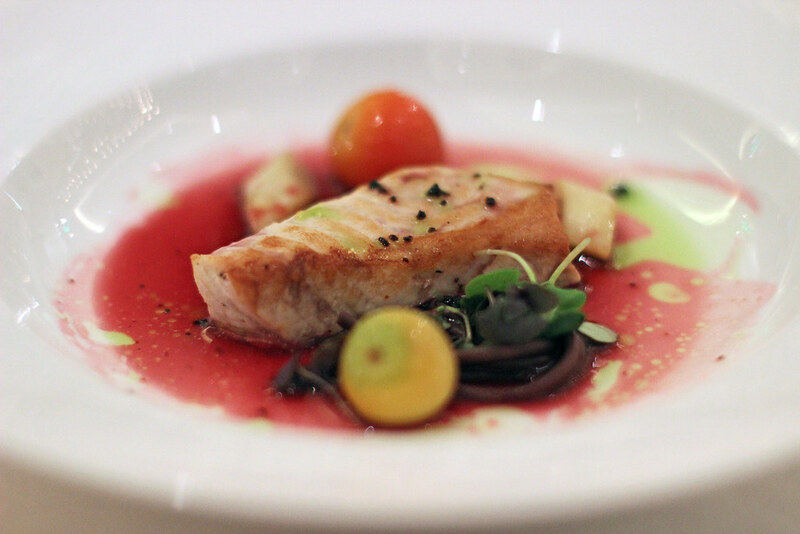 The slow-cooked swordfish featured Mediterranean flavors - there were Hammock Hollows tomatoes from upstate Florida, and heirloom green beans - but with some unexpected twists: the broth was cherry and olive, not tomato, and the dark soba-like noodles were vividly flavored with black olive. The final savory course came with a story. The family of one of the J&G kitchen crew, Chef Alex, are pork specialists in Oakland - since he was 11 years old, Alex helped them make carnitas and every other bit of the pig too. 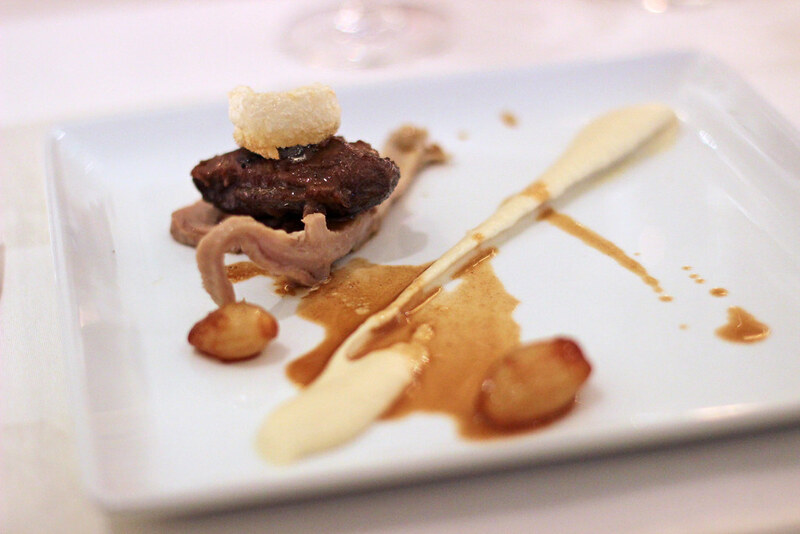 In tribute, we were served tender braised pork cheek and even more tender "buche" (stomach) "Bartolo Style," plated with a crispy chicharrone crown, along with a celery root purée and glazed pearl onions. 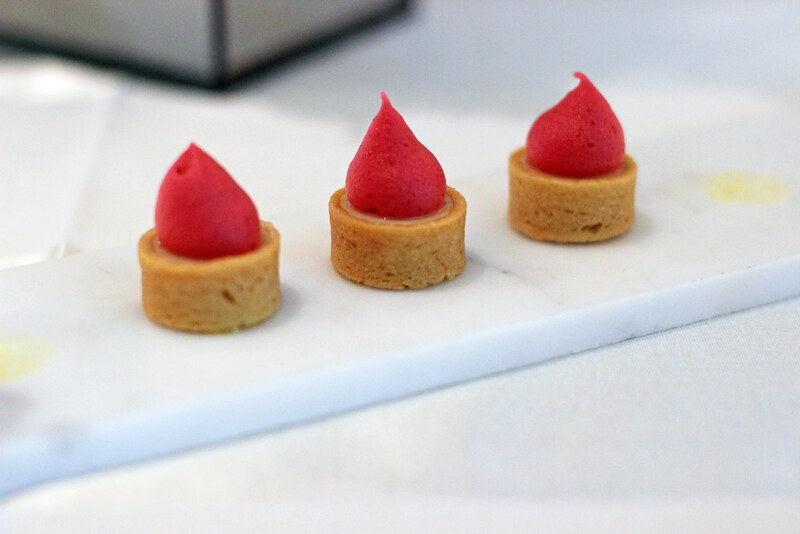 Now it was Pastry Chef Antonio Bachour's time to take over the spotlight. 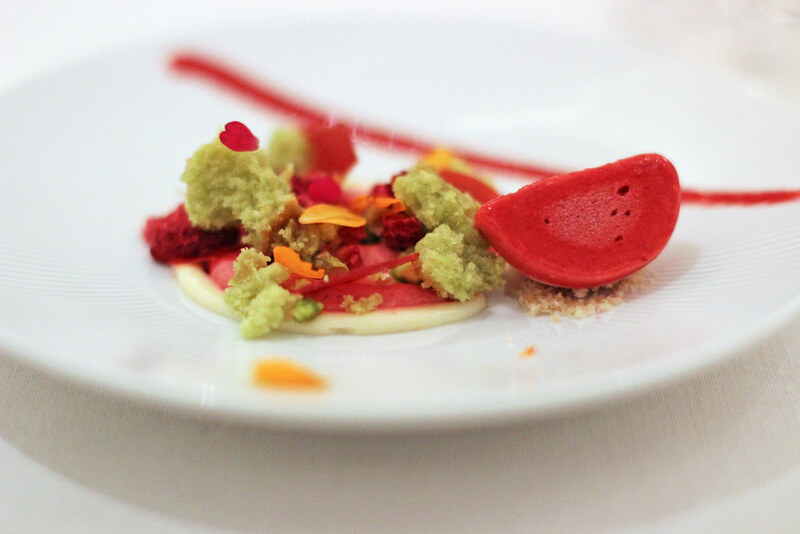 We had seen Chef Bachour's work once before at a Cobaya, when he did the desserts for a Chef Jeremiah dinner. He was working in extremely constrained circumstances there and pulled off some beautiful results - so I was looking forward to seeing what he could do in his own kitchen. 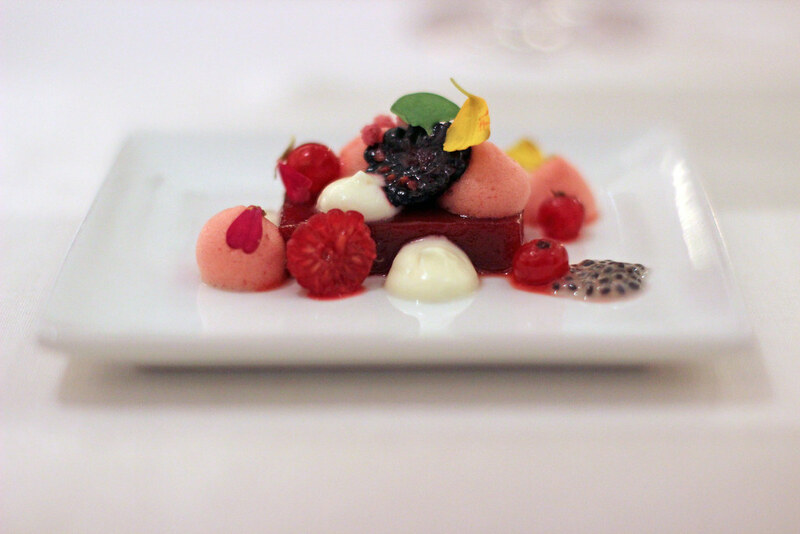 He began the transition to desserts with a take on "Berries and Cream." 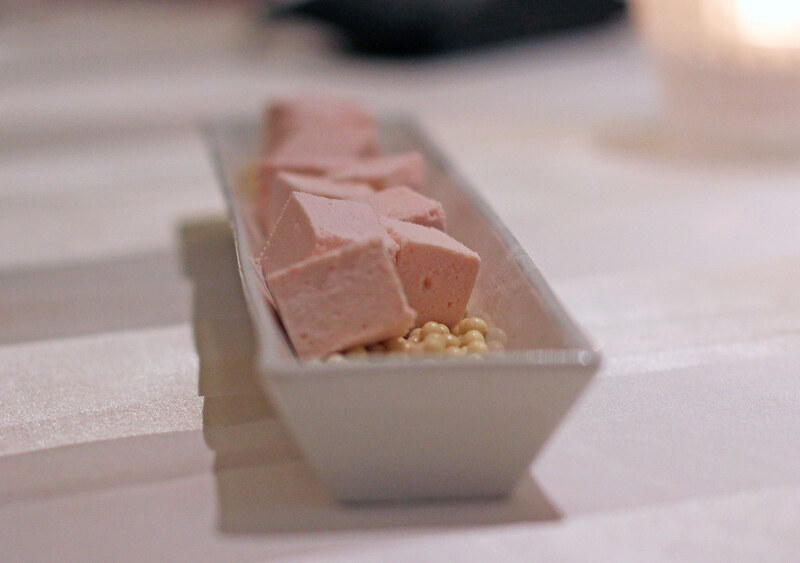 A cube of a ruby-hued gelée was festooned with various berries, red currants, wisps of berry foam, creamy gel, and a puddle of gelatinous hydrated basil seeds - fresh, light, and really brightly flavored. 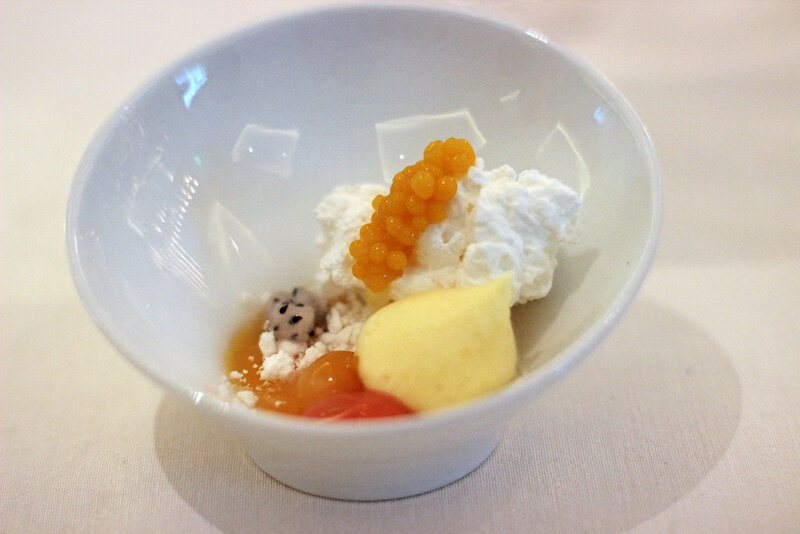 Things went in a more tropical direction with his next dessert: nitrogen-frozen coconut mousse, soft mango "caviar," passion fruit custard, and tiny cubes of dragonfruit - a great interplay of temperature, texture, color and flavor. 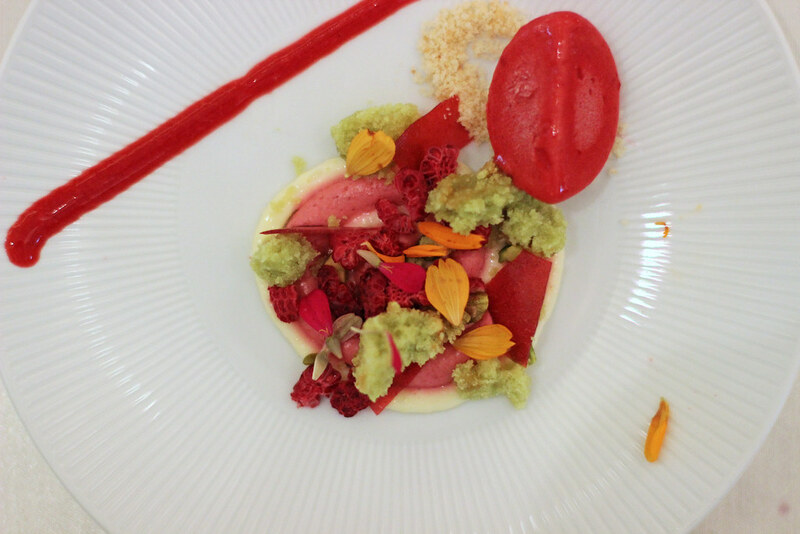 Once Chef Bachour gets started, it's tough to slow him down, and he had one more dessert course for us. 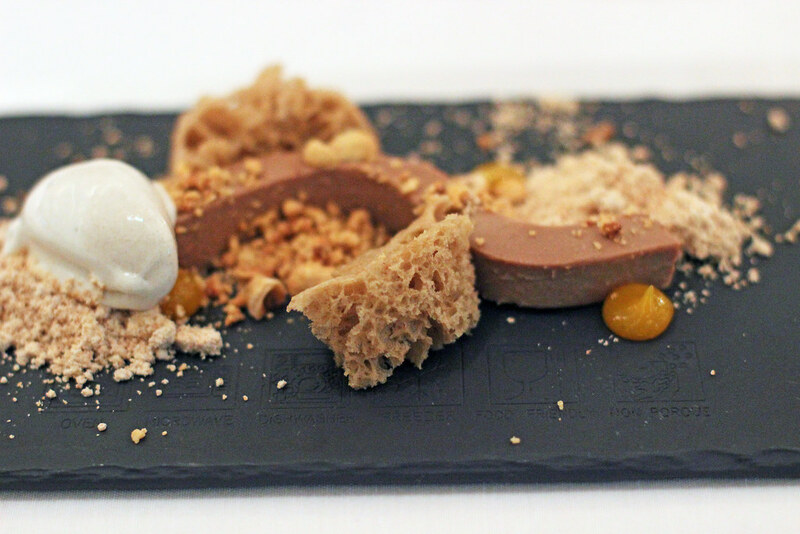 A milk chocolate microwave sponge cake was paired with a flexible tube of nutella ganache, rounded out by a caramelized white chocolate powder, a tangy banana yogurt sorbet, and the small component that really completed the dish for me, buttons of a bitter orange gel. And for a final send-off, an assortment of mignardises: chocolate piña colada lollipops, bacon macarons, guava marshmallows, and mini key lime tarts. 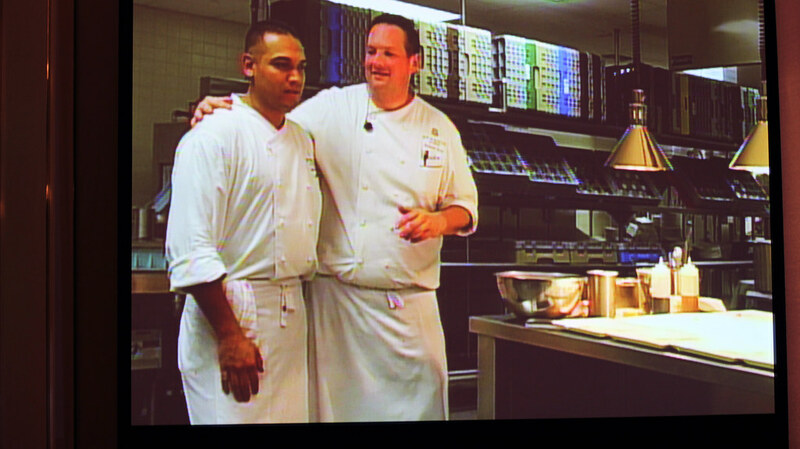 There is a lot of talent at the kitchen in the St. Regis, and it was exciting for us to get the opportunity through Cobaya to let them show off what they can do. 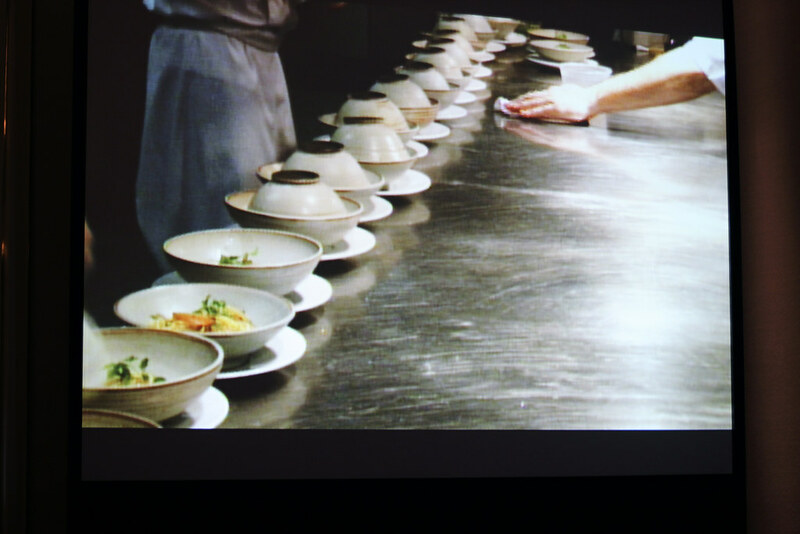 I get the sense, from the enthusiasm and energy of Chefs Gras and Bachour on display from the planning of this event until the last guest departed, that it was exciting for them too. 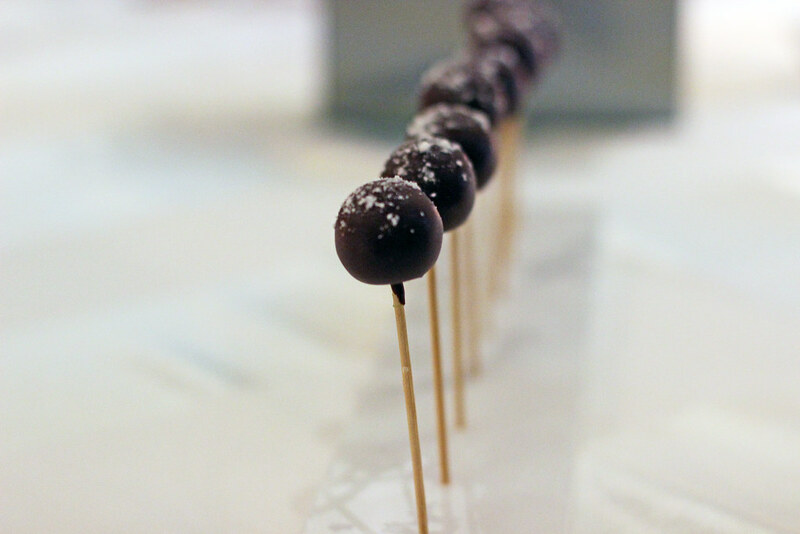 Don't let the tweezers fool you: there's plenty of passion here. 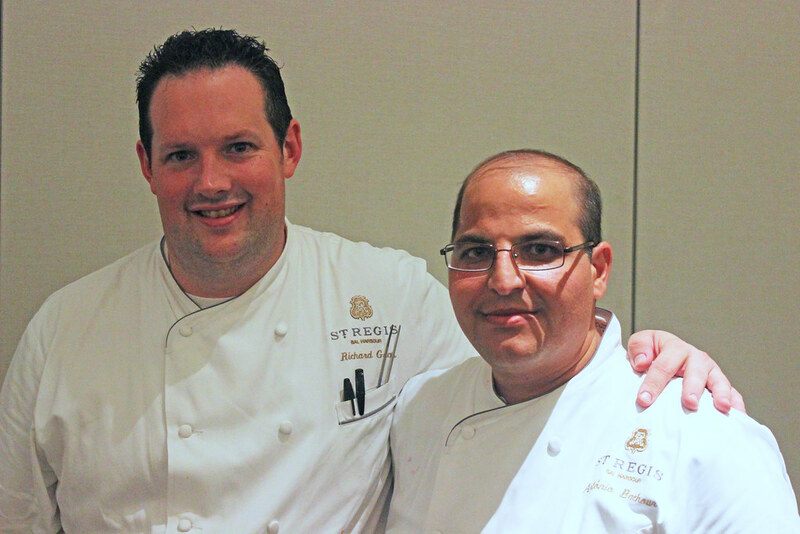 Many thanks to Chefs Richard Gras, Antonio Bachour, and Jordi Valles (of whom we got to see very little, as he was heading off to Peru); to the entire FOH, BOH and A/V crews at the St. Regis, who put together an excellent experience for us; to St. Regis GM Marco Selva for letting his team do this, and for joining us and appreciating the results of their efforts; and, as always and most of all, to the guinea pigs whose support makes these events possible. 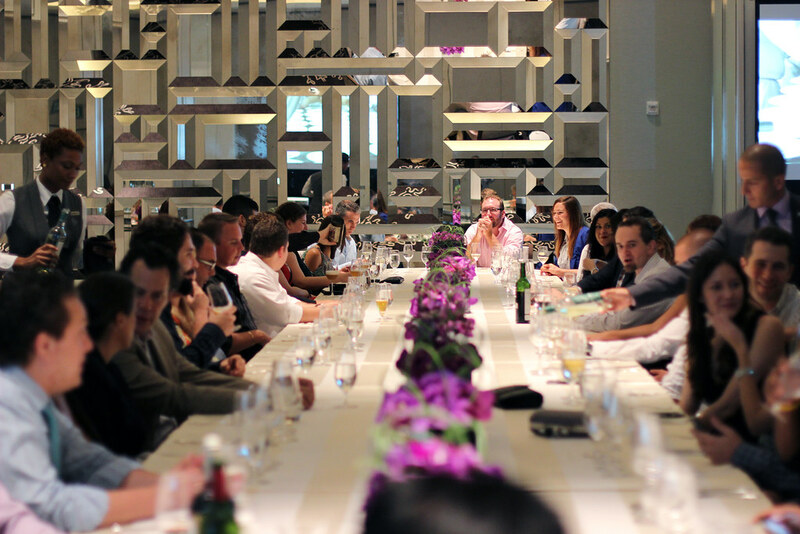 J&G Grill is one of the more recent additions to the seemingly ever-expanding empire of Jean-Georges Vongerichten restaurants. Some of you may remember Chef Valles from his ambitious and sadly short-lived Spanish restaurant Mosaico in the Brickell area. You can always count on Joshua David Stein to have an unusual take on such events. 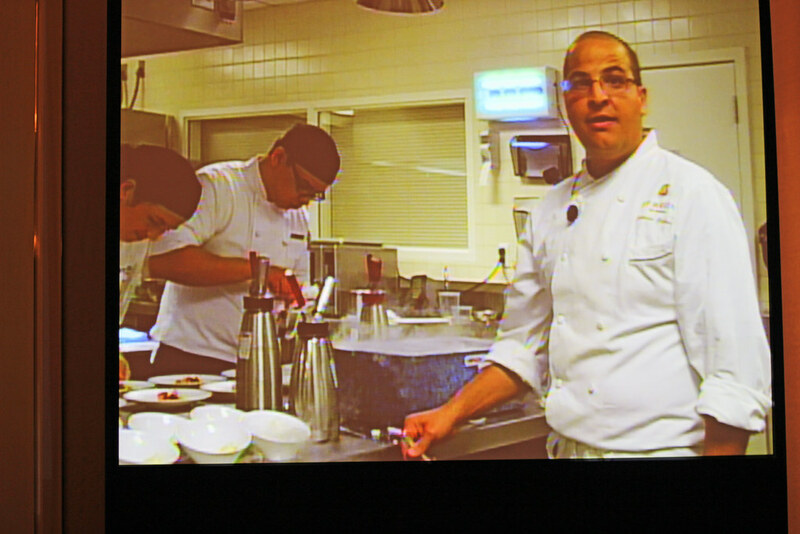 Chef Gras was not giving away his secret as to how he made the "smoked" pasta, but as is so often the case, Alex and Aki at Ideas in Food offer a couple of likely leads: "Smoked Pasta;" "Roasted and Smoked." 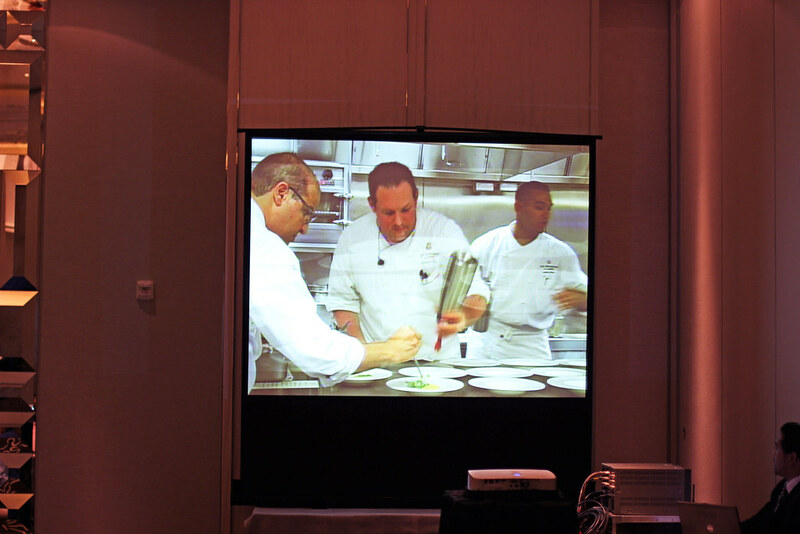 This was just one example where the A/V hookup into the kitchen proved a great tool for providing insights into the dishes. We always push for an "interactive" component to our Cobaya dinners: guests want to hear not only what's in the dish, but where it came from and why, and Chef Gras did a great job throughout the course of the evening in providing these kinds of details. The enthusiasm and excitement in the kitchen was palpable, which is always tremendously gratifying for us too. This is the point at which I mention my long-held obsession from childhood with Baskin-Robbins mandarin chocolate sherbet. It is difficult to select a star among stars, but the crispy poached egg might just deserve such a title. 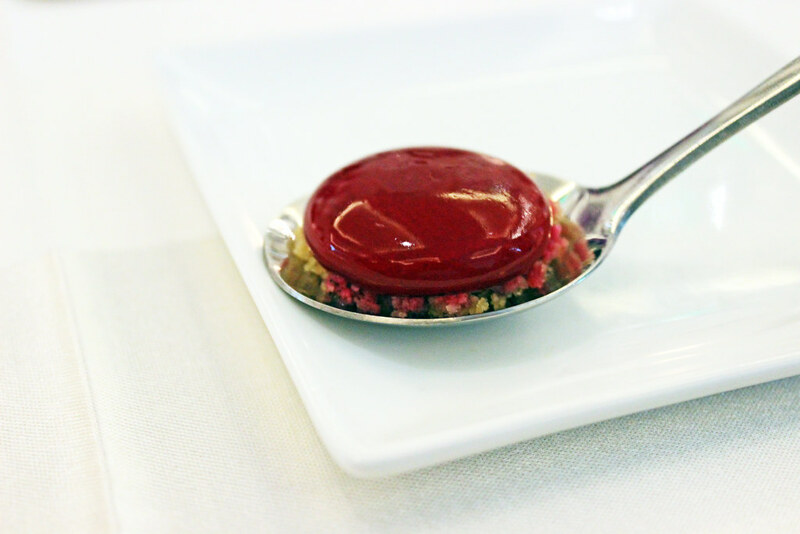 The brilliance was in taking a simple, basic, ingredient and transforming it to a culinary masterpiece. 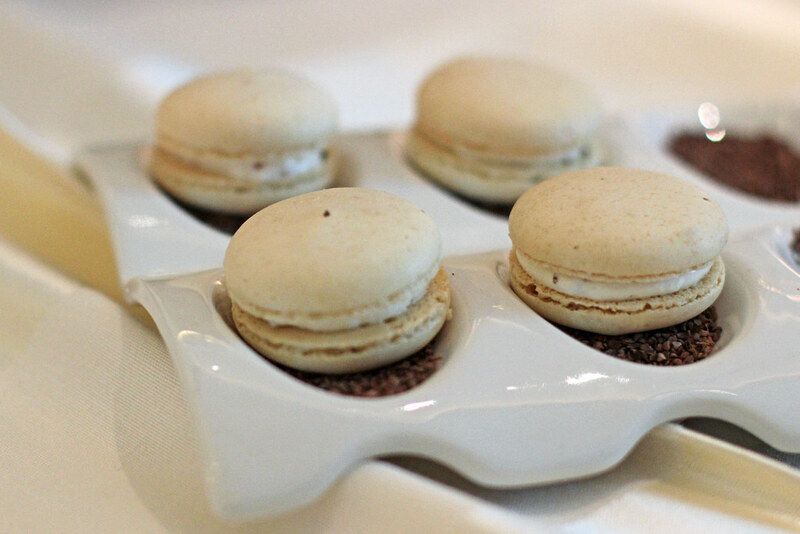 A close runner up was the bacon macaroon. This was truly a gastronomic symphony.